We can plan & run an effective social strategy to help grow your business, maintain your social presence and engage with your target audience. "I don't understand social media!!" Many brands don't understand that 'doing social media' isn't just advertising or promoting yourself. It's about creating a two-way relationship. Social media has changed how you relate to your customers, and it’s important to use it correctly if a business wants to grow and maintain its customer base. But knowing how to use this great medium to reach new customers and create loyal ones is a imperative to this success. After all, it's called Social for a reason! Social media, such as Facebook, Twitter, Instagram and Google+ have become key online marketing strategies to help any business or brand stand out from the competition. It helps raise your profile, and has become today’s form of customer service. We will tailor Social Media Marketing strategies specifically conceived for your brand and your audience that aim to attract new customers and increase your profitability. 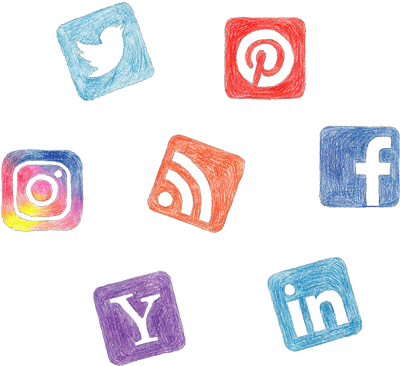 Using platforms such as Facebook, Google+, Twitter, Instagram, Pinterest and LinkedIn, our Social Media Services give you opportunities to connect and share information leading to an increase in the awareness of your brand, product or service. The results of your Social Media strategy are reflected in the number of re-tweets, shares, comments, likes and views. However, whats most important is to encourage interaction and conversation. Facebook, Twitter or Instagram content can increase your traffic in a short period of time. We'll help determine the most suitable type of content and platform for your brand. We can manage your accounts on your behalf and engage with your audience, or advise you on the most effective ways to do so yourself. We can create and customise Social media profiles for you with quality content and aesthetics that resonates with your brand and audience. There are important ways to use social media to grow your business. It’s not easy and its not instantaneous, but it is now an extremely effective way to get ahead of your competitors, because it’s intimate and direct. Just like word of mouth, social media reviews are one of the most important ways potential customer’s use to choose you over your competition. As in the real world, negative comments and bad reviews online are a fact of life, and it is important to know how to manage them. But contrary to most business owner’s initial concerns, they won’t bring your business down! In fact statistically, a business without the odd negative public review, or worse with NO customer feedback at all, is viewed suspiciously, and less likely to convert a browser into a customer. So, what do I do about them? Directly responding to a customer who complains about you, usually creates a positive outcome. Online this can often result the removal or modification of their original complaint. Furthermore, when a visitor who sees that you have directly responded to someone’s complaint, they see’s this as a positive reflection on your business as a whole. So instead of worrying about the what you can’t control or don’t understand, take control of your brand online by setting up official Facebook, Twitter or Google+ profiles that people can contact you on, so you can put things right. A professional SEO and Social Media Management service can protect your brand online by setting up tracking and analysis programs for your Facebook, Twitter and Google+ activity. Tracking where and when your visitors are coming from and how often they share, cataloging their likes and dislikes allows you to know what information they really want, and provide a much better service. Unlock the full potential of your brand through social media and spread the word!